Brad Bernthal; "Hacks for Entrepreneurial University"
Brad Bernthal, Law Professor at CU Boulder and Founder and Director of Silicon Flatirons Center’s Entrepreneurship Initiative spoke to Concordia University Texas on Spetember 13th in a talk sponsored by IncubatorCTX and the Greater Austin Chamber of Commerce. Concordia leadership team members Dr. Don Christian, Beth Atherton and James Candido had met Brad when they visited Denver and CU Boulder as part of a Greater Austin Chamber trip. We were delighted for Brad to visit Austin. Bernthal launched Silicon Flatirons Center’s Entrepreneurship Initiative in 2008 and since then, it has consistently created a high velocity of interaction between the CU campus and the Front Range’s high tech entrepreneurial community. In his talk, “Hacks for an Entrepreneurial University: Notes from CU Boulder” Bernthal shared his experience. Start small. Don’t wait for check to build an empire. Be a platform that curates content. Community is extension of classroom. Build and nurture mentor networks. 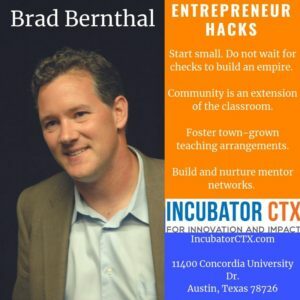 A luncheon and Meet & Greet with Brad Bernthal followed in IncubatorCTX. This was more of a laid back scene and attendees were given the opportunity to ask some follow-up questions and advice for Bernthal. Mingling took place and Bernthal was able to speak one-on-one with members of Concordia University and entrepreneurial community.